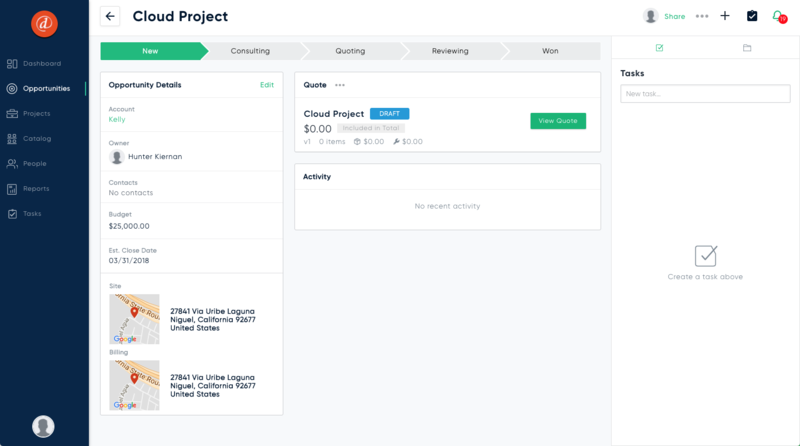 Track your potential projects separate from those you have won (known as a Project). Create quotes with your equipment and services. Present proposals to your potential customers. Describe a business process around this stage of the project lifecycle which is unique from the implementation stage. Once an Opportunity is won it is promoted to a Project which enables additional features which are specifically designed with project implementation in mind. To get started with opportunities, first you will need to navigate to the Opportunities area of Cloud. Opportunities can be viewed one of two ways, in list or Kanban view - Kanban is the default. Each of the vertical bars in the Kanban board represent a user configurable stage of the sales process that each of your opportunities can be dragged and dropped into to represent where they are in the process. 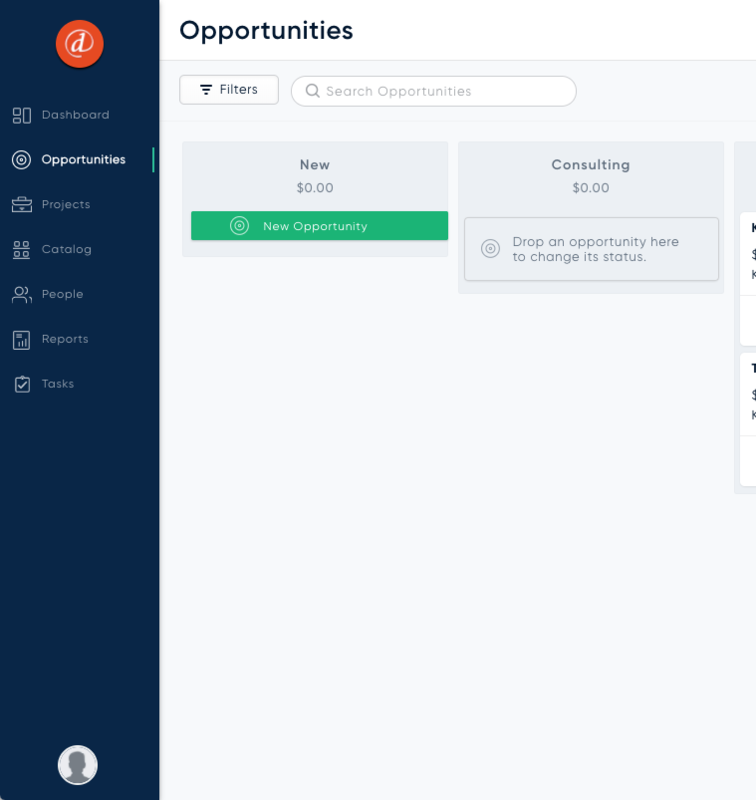 Next you will click the "New Opportunity" button found in the first stage which will present you with a form to capture key information about your new opportunity. Account - your potential customer and a place to keep track of important contacts. Budget - this is your estimated budget and serves as a target for your quotes. Project Type - a user definable selection that informs other members of your team as to the composition of the project (ex. New Construction vs Retro). This can also be used to help calculate budgets and other defaults for the opportunity. Square Feet - this information can be used in a future step to auto-calculate the total length of materials such as cable based on this value and others that you have provided. Taxes - Taxes can be configured under the Advanced section. 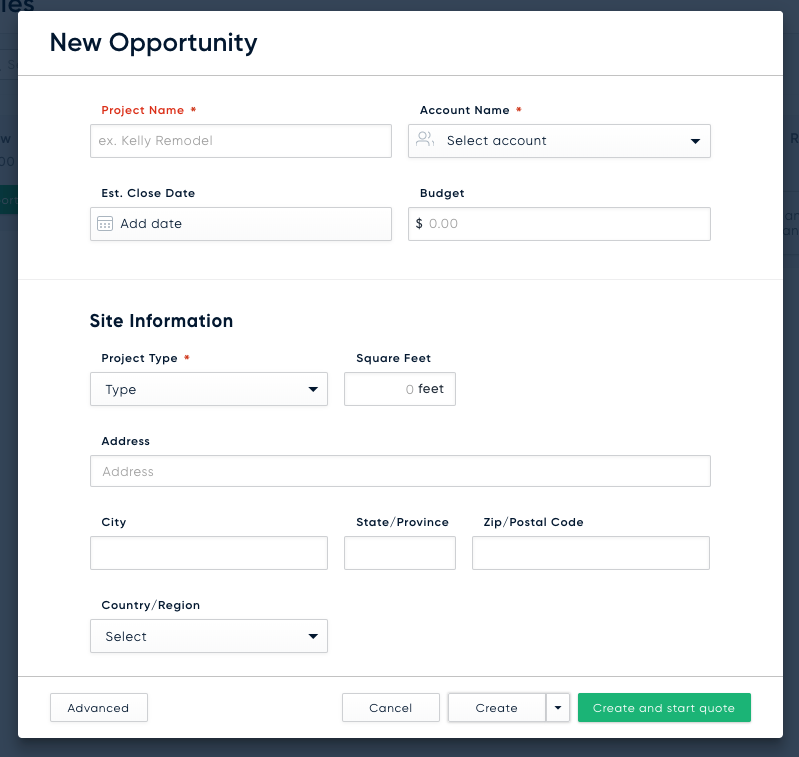 Tip: Even though most the information in the create opportunity step is optional, consistently entering this information will help you in the future with reporting and improving your business. Once the form is complete, the "Create and start quote" button will create the opportunity and redirect you to the opportunity's quote where you can begin adding products and services through the search bar at the top of the quote. Alternatively, you can choose the "Create" button which will bring you to the newly created opportunity where you can provide more details about the opportunity, create tasks, share with resources in your company, and attach files.